(Nanowerk News) A complete description of nanoscale thermal transport is a fundamental problem that has defied understanding for decades. Here, researchers uncover a new regime of thermal transport near nanoscale structures, where counterintuitively, nanoscale hot spots cool more quickly when placed close together than when they are widely separated ("A new regime of nanoscale thermal transport: Collective diffusion increases dissipation efficiency"). Hot nanowires emit lattice vibrations known as phonons into underlying materials. When closely packed, phonon collisions can more efficiently transport heat away. This finding suggests new approaches for addressing the significant challenge of heat management in nanosystems, with design implications for integrated circuits, thermoelectric devices, nanoparticle-mediated thermal therapies, and nanoenhanced photovoltaics for improving clean-energy technologies. A great challenge in the semiconductor and electronics industries is that as nanoscale features get smaller and processes get faster, significant amounts of heat need to be quickly carried away from the nanostructures. A team from JILA, University of Colorado, and Lawrence Berkeley National Laboratory made a counter-intuitive discovery – it is much easier to cool hot nanostructures when they are arranged closely together rather than far apart. This result is exciting for the field of thermal transport because in 2010 the same team showed that small, isolated hotspots are, in fact, quite challenging to cool. In the current experiments, the team patterned an array of nanostructures on different materials. 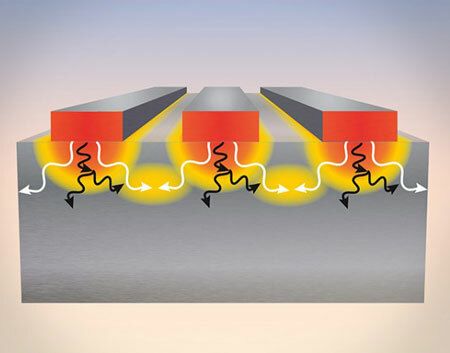 When the nanostructures were heated with an infrared laser, they emitted phonons (lattice vibrations), which traveled into the substrate and collided with other phonons, carrying away the heat. When the nanostructures were placed close together, cooling was more efficient because it did not matter whether the interacting phonons came from the same large hot nanostructure or neighboring small hot nanostructures. Thus, paradoxically, arranging the hot nanostructures more closely together actually enhanced heat dissipation. These experiments enabled the researchers to determine which lattice vibrations carry heat away from a hot region and also to predict new ways to engineer the cooling rate in a material.